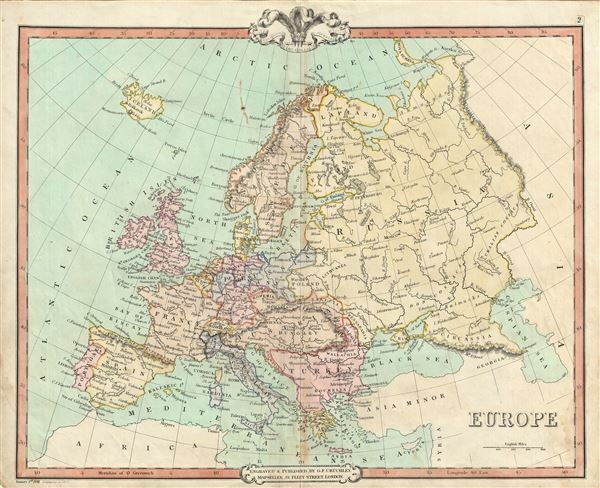 This is an attractive 1850 map of Europe issued by George Frederick Cruchley. It covers the entirety of the continent, including Iceland, from the Arctic Ocean to the Mediterranean Sea and from the Antarctic Ocean eastward as far as the Ural Mountain range. It shows the Austrian Empire at its height and the many states of the German Confederacy. This map was created at a time in history that witnessed the unification of Italy and saw the British empire rise to its peak. It was also a time of decline for the Ottoman Empire. The map is color coded according to countries and territories with various towns, cities, rivers, mountains and several other topographical details identified. Elevation is rendered by hachures. Cruchley's General Atlas was unique for its period, employing a vivid color scheme extending even to the oceans, distinctive typography, and various uncommon decorative elements including a peacock feather crown and an imprint medallion, both of which break the printed border. Though many of the maps in this atlas are copyrighted in 1841 or 1842, the atlas was first published in 1843 from the Cruchley office at 81 Fleet Street, London, and proving popular went through numerous reissues well into the 1850s. Very good. Minor wear and some toning over original centerfold. Blank on verso. Spotting near the Lofoden Isles.